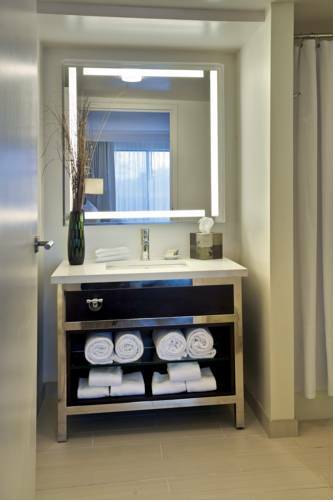 Style and sophistication await at Renaissance Westchester Hotel. We provide a prime location that complements the dynamic and colorful destinations surrounding us. Venture to the city of White Plains, The Capitol Theatre, Manhattanville College and The Westchester, all nearby. Unwind in our elegant rooms and suites boasting warm brown and beige hues that will lull you into relaxation along with our plush bedding. Satisfy your appetite with our convenient room service, or dine at Hive Living Room + Bar, open from morning to dusk to serve locally inspired America cuisine. Chef's Table will elevate any dinner with five- and seven-course meals when reservations are made in advance. Need to host a professional or social event? Our hotel features 27 redesigned event venues for your wedding reception or business convention. Before any stay is complete, visit our indoor pool, tennis courts and 24-hour fitness center for an energizing workout. Savor a renewing stay at Renaissance Westchester Hotel. Hive Living Room + Bar: Open for breakfast, lunch and dinner, Hive Living Room + Bar features American cuisine in a stylish setting. Visit with friends, family and colleagues while savoring dishes using locally sourced ingredients complemented by our inspired cocktails. Chef's Table: Chef's Table elevates the fine-dining experience in Westchester with a reservation-only setting. Our award-winning chef prepares a five- to seven-course meal with unique wine offerings. Chef's Table is ideal for rehearsal dinners and corporate retreats.